Will the Tesla-SolarCity Merger Be Good for the Solar Industry? Tesla is an American automaker, energy storage company, and solar panel manufacturer, and SolarCity is an American company that specializes in solar energy services. Tesla had already experimented with solar technology before the merger, and is looking to expand its reach with solar power innovation. SolarCity’s solar panel factory is being built in Buffalo, New York, one of the country’s poorest Rust Belt cities. It is part of a billion-dollar plan to stimulate the economy in upstate New York and is supposed to bring thousands of new jobs in the next years. However, the viability of solar varies from state to state and has received backlash in some states. Musk claimed that the installation of SolarCity’s roof panels might be even cheaper than the installation of a regular roof. This could be a big boon to the industry as solar panel’s typically high upfront costs can turn off homeowners. Musk believes that Tesla’s single roofing supply chain and high-strength glass tiles will reduce costs, possibly even eliminating the need for government subsidies. 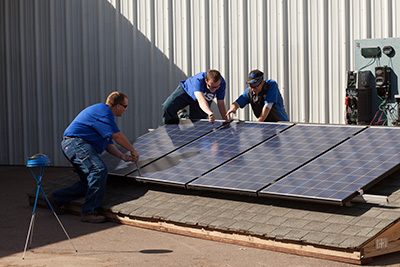 If you are interested in a career in solar technology, The Refrigeration School’s electro mechanical technologies program offers a solar technology module where you can learn the fundamentals of solar energy.